Now, I was concerned about how spray painting tree stumps would really work out. Really concerned. 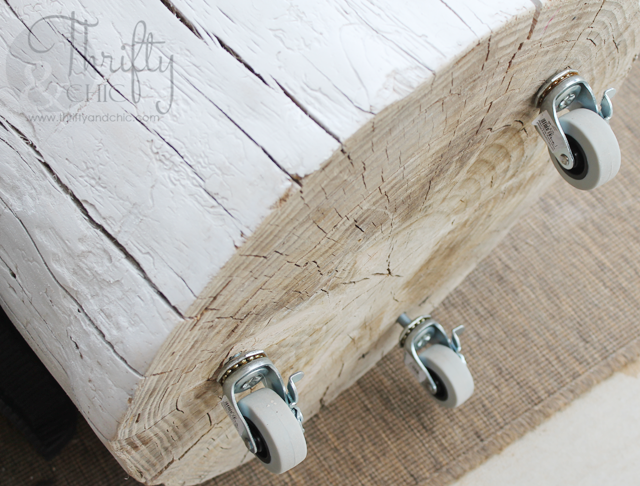 I painted the heck out of the coffee table that I made out of 3 tree stumps back in the day. 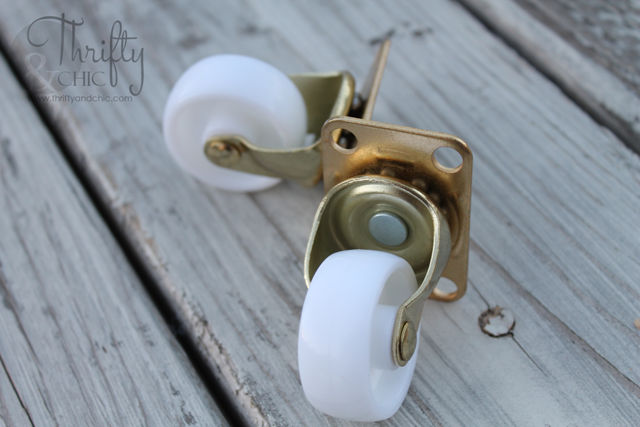 ...like slathered layers and layers of paint on them, and they still look great! But, I was really worried about how spray paint would take. As you all know, wood absorbs and absorbs everything. Especially paint. 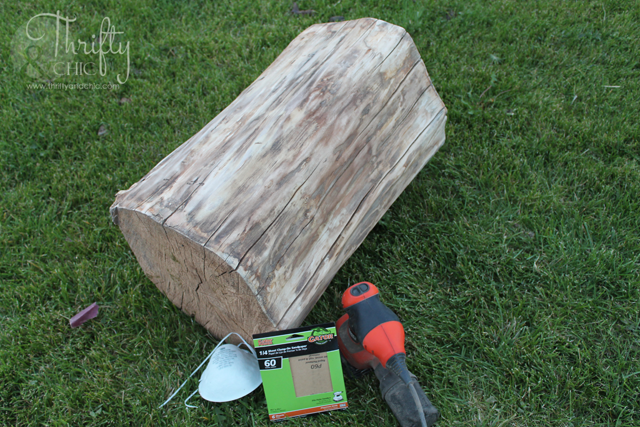 So, I seriously went out and bought like 5 cans of spray paint for one stump :) Luckily, I didn't need that much. It turned out better than I had thought. 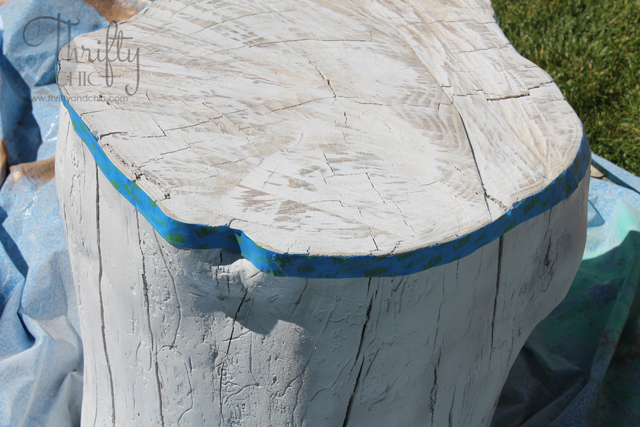 Score for spray paint and tree stump lovers! Next up. 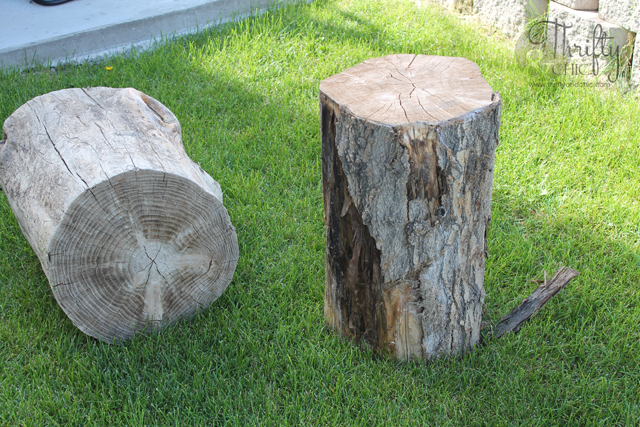 Where do you get your tree stumps if you don't have a pile sitting in your backyard? Check the classifieds! It's that easy. 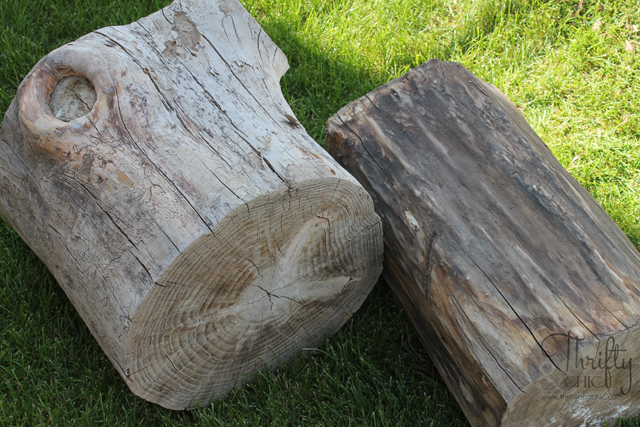 So many people are trying to get rid of old wood from a dead tree or selling firewood. If they are selling firewood, more than likely they got that firewood from a stump ;) So, ask if they have some stumps still lying around. Or if you are up to it, travel around where there are some farms and large lots of land. More than likely you'll see piles of stumps. Knock on the door and see if they would sell some to you...or give you some :) Or you can call some tree movers. I found my stumps on the lot of a local tree removal service. When you find your stumps, you want to make sure they are seasoned. That means they should be pretty white and dried out. If they have bark on them, it should come off really easily. More than likely when you peel the bark off, it'll be wet underneath, so you'll have to sit it back out in the sun for a few more days to dry out. You can see here the difference between the seasoned and dried out stump compared to the one that's bark was just removed...super wet. To remove the bark, just get peel it off, or get the end of a hammer and pry it off. It should be relatively easy. If it's not, your stump isn't ready. 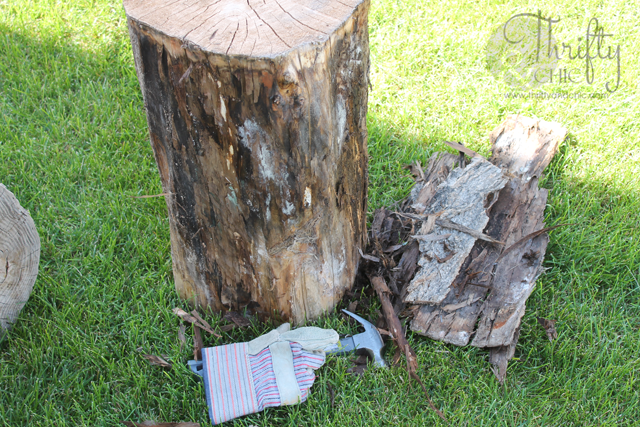 Once you have all the bark removed or if you are lucky and found a stump with no bark, start standing. I used 60 grit sandpaper...the super rough kind...to get rid of a lot of the random pointy areas and the saw marks. This will make it super smooth. Now time to prime! 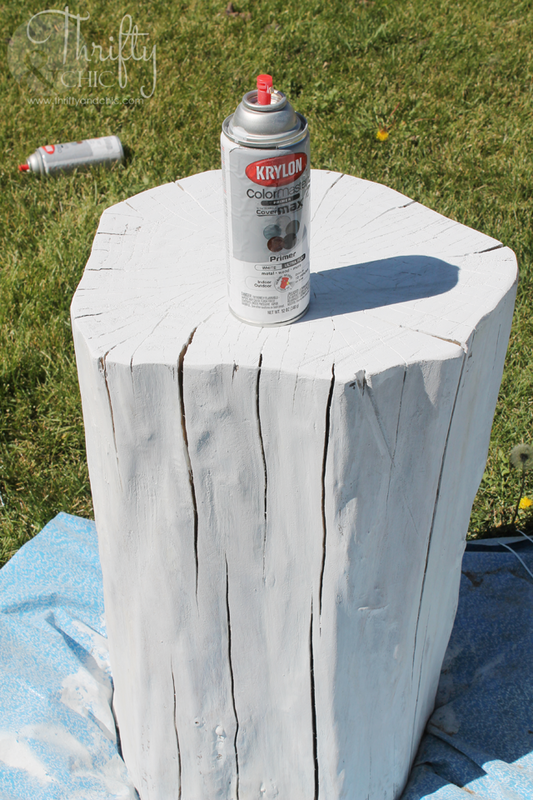 If you are painting the stump a light color, such as white, you'll want to use the Kilz primer and yes, they make it in spray paint form :) This will help block the inevitable yellow stains from showing through your top finish. If you aren't concerned, then go for the cheap primer cuz you're going to have to use about two cans or so. Now finish it off with a top coat! For the gold one, I just chose Gold from Krylon. For the white and turquoise one, I first sprayed the top coat of white around the whole base and then taped off around the top edge. 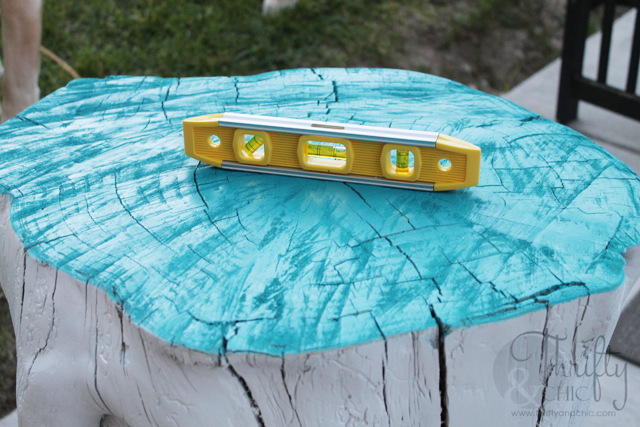 I then just painted the top with turquoise from Rustoleum. And there you go! 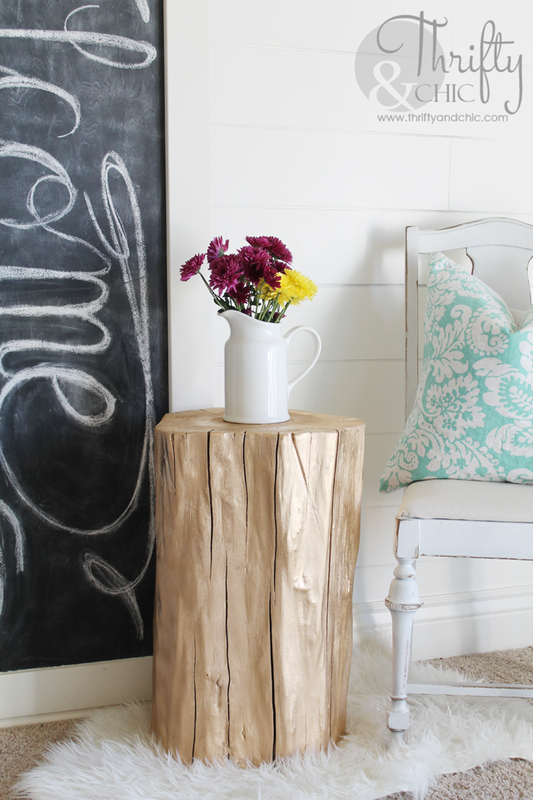 This is a long post, but it doesn't really take too many steps to get your stumps turned into a side table. And they are relatively easy steps, especially if you don't have to deal with bark or mold. The best things about stumps? 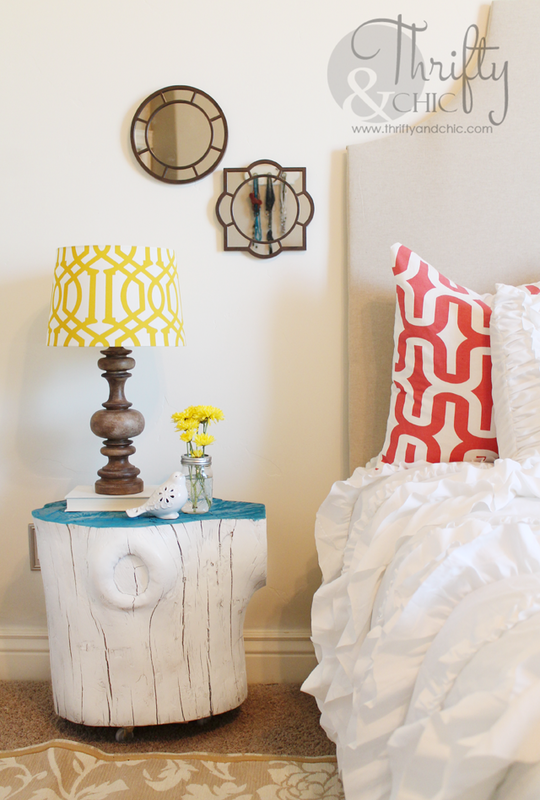 They are so customizable...even though they really are just a big hunk of wood. You can find them in varying widths; make them any height you want and any color you want. And if you are completely against painting wood, you can easily stop at the sanding, and just put a clear top coat over it instead. 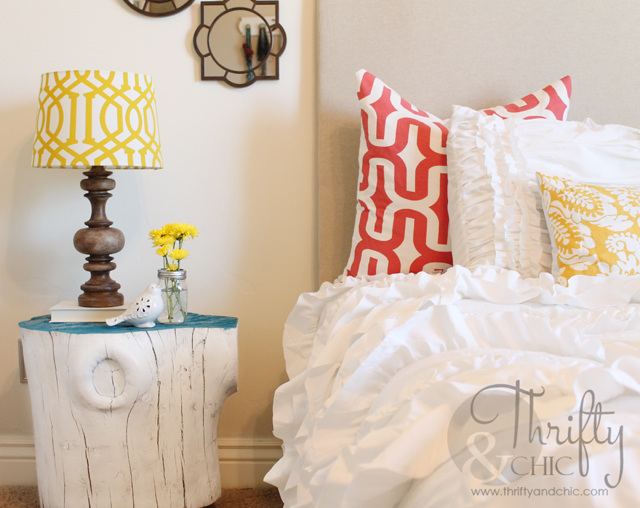 Where did you get your white ruffly bedding? I believe it was Joss and Main a few months back. I think I saw it online somewhere else too but I can't remember where! You were great!! And you looked fabulous!! 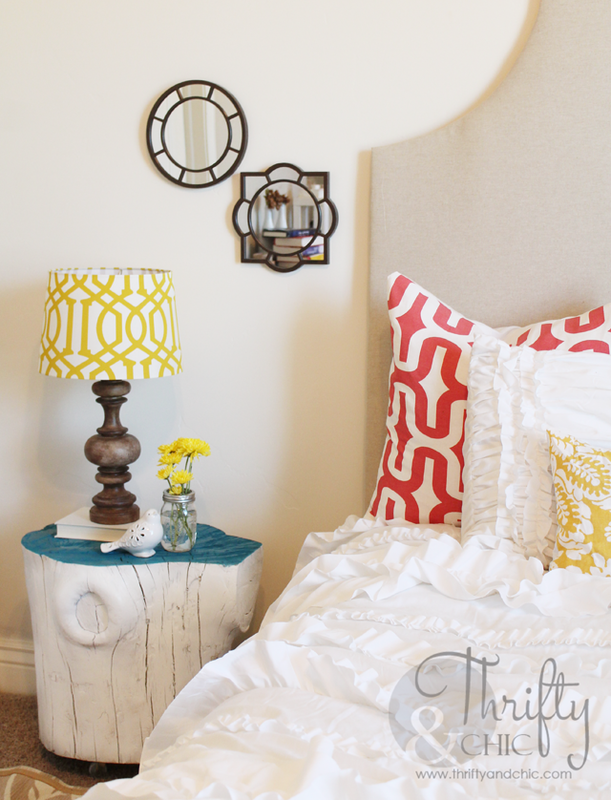 Love the gold stump! So cool.. Awesome post! I have approximately 10 stumps in my yard right now, and I've been itching to fix them up. Thanks for sharing! Yes! I have been wanting to do this but couldn't figure out how to get it level. Going stump hunting in the backyard immediately. Thank you so much. wao such a great idea for our tree removal company. Would definitely take a look on that and it really help us in our business expansion ... A new thing to business and even for customers. 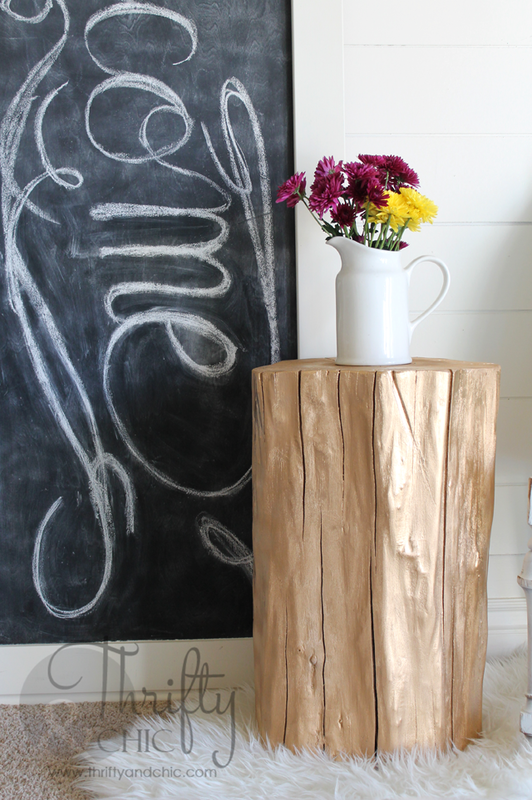 These spray-painted tree stumps are actually super classy looking. This helps me know how to best use the stumps when I have them removed from my yard. The tree came down last week. Now I just have to figure out how to pull the stump out of the ground. The white looks so beautiful.